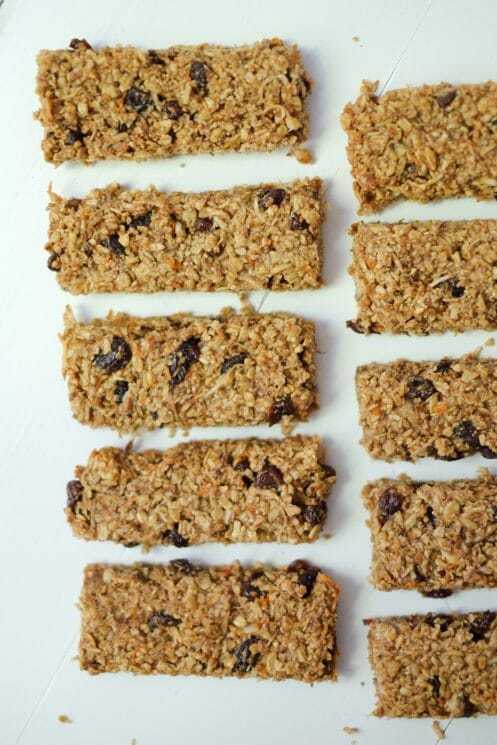 We love how versatile and easy granola bars are for all sorts of occasions! Perfect for packing in a school lunch or grabbing for an afternoon snack. They even work great for breakfast on-the-go! And this healthy carrot cake version has the added bonus of a veggie thrown in! 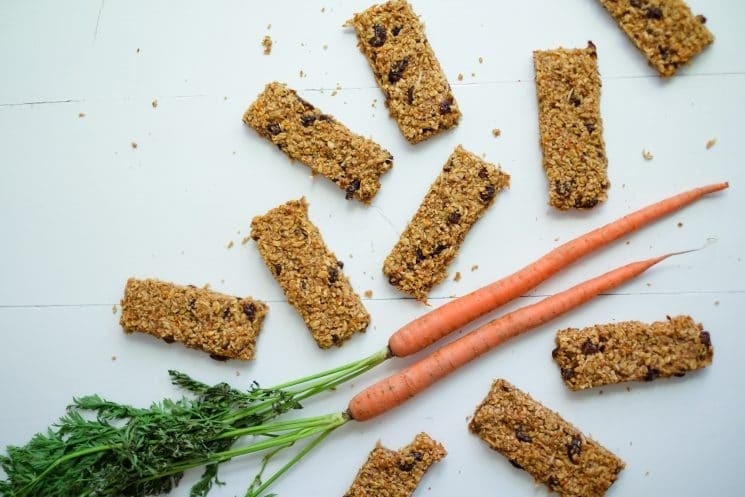 With oats, flaxseed, carrots, raisins, nuts and almond butter, this bar is loaded with fiber and protein to help kids stay full until dinner. 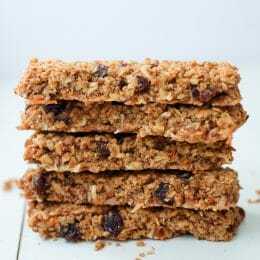 Soft, healthy granola bars that stick together! 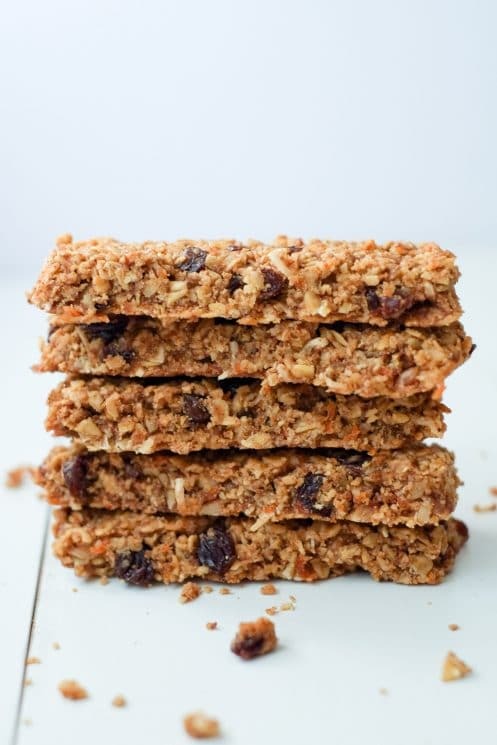 After experimenting a bit, we found that getting granola bars to stick together can be tricky! Many granola bar attempts end in just granola – not bars. To avoid this problem, this recipe has three different binding agents – honey, almond butter, and a flax egg. If you’re not familiar with flax eggs, they’re essentially a gloopy mixture that forms when you mix ground flaxseed and water. Vegan friendly (and pretty neat if you ask me!). Chopping up the oats a bit also helps the concoction stick together better. Full-sized rolled oats are great and all, but they tend to break apart a bit easier because of their larger, flakier shape. A few quick pulses in the food processor did the job nicely! Our first step is to make a flax egg. 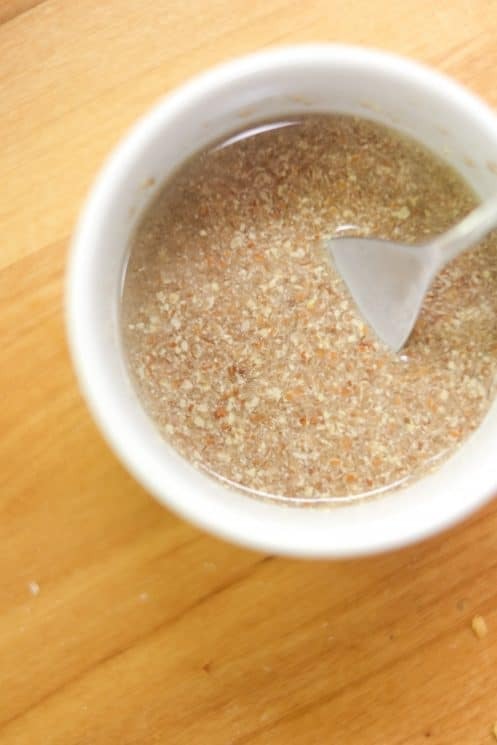 Simply mix the ground flaxseed and water. Then let it sit and watch it morph into a gel-like mixture! Next, we pulse the oats and nuts (I used pecan, but anything you like works) a bit in a food processor. Once the oats and nuts are cut down to a small-but-not-completely-pulverized size, combine them with the other dry ingredients and carrots. Mixing the honey and almond butter is our next step, and it’s much easier if it’s warmed up just a bit. I did this in the microwave, but you could definitely do it on the stove. Finally, combine everything together and see the colorful mixture take shape! (Don’t you just love that vibrant orange?). Press the mixture into a parchment-lined large baking dish until it’s about 1/2 an inch thick. Use a spatula to push it down so it is really compact! This will help the bars stick together. I didn’t want my bars too thin, so I didn’t spread the mixture out to cover the whole surface of the dish. Once in the oven, you know the bars are done when the edges have just started to brown. Remove the dish from the oven and allow to cool for about 10 minutes – just enough to set up a bit and not be scalding hot. If you prefer crunchier granola bars, keep them in a bit longer until they get slightly browned on top too. Then, cut bars into whatever shape your heart desires – I made mine long and skinny in typical granola bar fashion. Allow to sit and cool completely before removing the bars and eating them. Store any extras individually wrapped in plastic, or all together in an air-tight container for 3-4 days. Voila! 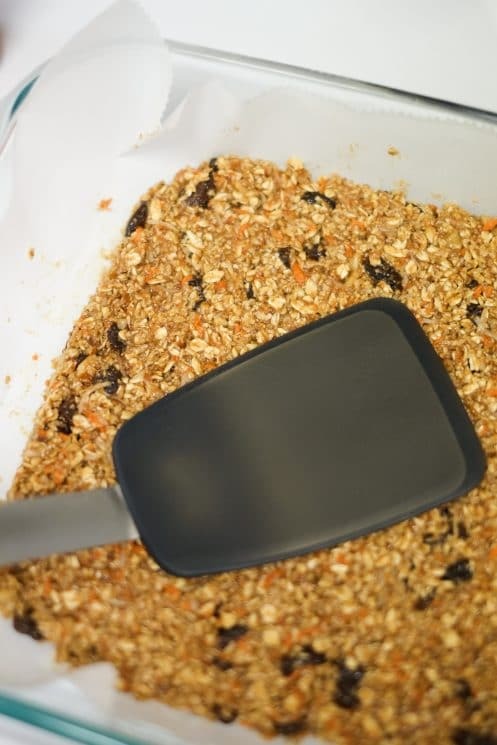 Healthy, chewy, filling carrot cake granola bars ready for the lunchbox or grab-and-go breakfast! You’re gonna love ’em! Preheat oven to 350 degrees and line a 3 quart baking dish with parchment paper. Combine ground flaxseed and water in a small bowl to make a flaxseed “egg.” Allow to sit for 10 minutes to congeal. Pulse oats and nuts in a food processor until semi-finely chopped but not powdery. 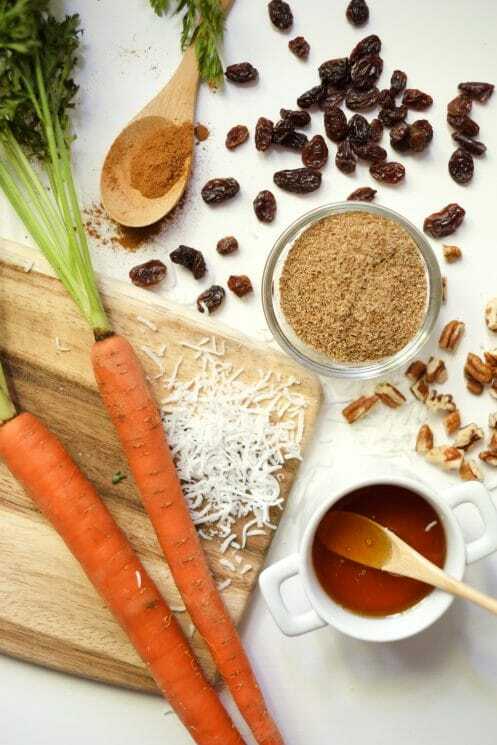 In a medium-sized bowl, combine pulsed oats and nuts, raisins, grated carrot, coconut, cinnamon, and salt. Set aside. In a microwave safe bowl, heat honey and almond butter for 20 seconds, or until easy to stir together. Add the honey/almond butter mixture and flaxseed egg to the medium bowl with oat mixture. Stir until fully mixed. Pour mixture into lined baking dish and spread out until it is even and about 1/2 inch thick (mixture likely will not cover the entire length of the baking dish). Remove from the over and allow to cool for 10 minutes before cutting bars. Let cool completely before removing and eating bars. Hi, is there a way to cut back the honey and still have them stick? We’re a pretty low sugar family and I’d like to have about half the honey this calls for. Hi Sarah! Good question. I haven’t tried yet so I can’t be sure- but I have hope that half the honey might work since there’s almond butter and the flax egg to help things hold together. My husband requested these again so I’ll try it out and let you know! And if you get to it first, let us know! I’d love it if it works out. Hello again, Sarah! I just made these with half the honey (1/4 cup) and they worked great! At first I was a little nervous because they seemed dry when I combined everything, but they held up fine in the oven – maybe only slightly more crumbly, but not much. I just made sure to pulse the oats and nuts pretty well and spread the mixture on the thick side for baking. Thanks for asking – I’m happy to cut sugar when I can! Hi! Do you think these keep just as well in the freezer or refrigerator? I like the idea of having them last longer as quick go to snacks but 3-4 days wouldn’t be enough time. Hi Mirav! Yes, we actually put some of ours in the freezer and it worked really well! We just grabbed a couple on our way out the door and they thawed by the time we needed a snack. Thank you!!! Can’t wait to make them. Hi, this recipe looks great, but is it possible to make a nut free version? Wanted to make these for the school cake sale as a healthier alternative. Hi Farzana, good question! You can definitely leave out the nuts and just add more coconut and/or raisins if you like. The tricky thing will be getting the bars to stick together without almond butter. If seed butter is something you are okay using, I think sunflower seed butter would work really well. If not, it might work to add a few tablespoons more honey and double the flax egg – I haven’t tried this myself though. Let us know how they turn out for you! The nutrition facts at the bottom of this recipe say that there are 599 calories per serving. That can’t be right, can it? Hi Andi! Our system defaulted this recipe for 4 servings. You can actually get about 12-14 granola bars out of it. That makes each granola bar approximately 175 calories. Thanks for bringing this to our attention! Hi! Can you substitute maple syrup for honey? Great granola bars. I appreciate that I don’t have to make granola first and then make the bars. Didn’t have almond butter, substituted peanut butter. Didn’t have raisins, substituted cranberries. Used an egg, rather than flax seed egg. Despite the substitutions, they baked into moist snacks which held together well. Thanks for this… it’s now in my files!